This is the homepage of the Fitzbek Rose Garden, a private rose garden in the first place dedicated to collect German roses of the so called "Golden Era" of German rose breeding. At the present time about 300 different cultivars belong to this collection. 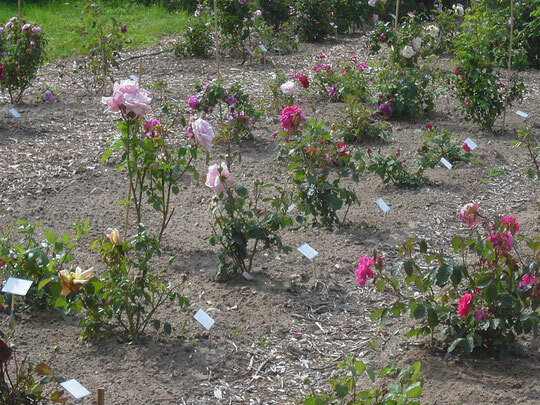 Additionally the Fitzbek Rose Garden contains a collection of about 60 different cultivars of Moss roses and a circa 30 different cultivars of Czech roses of the 1930ies. One of the young rose beds, first year after planting. All photos on this website were either taken on site or at the Europarosarium Sangerhausen, when the roses in our garden did not make the perfect models. All photos on this website are subject to copyright. They are for free for private use, but I'd like to be asked beforehand. If any professional use is planned, we will find a way.